PETA demanded this week that the organizers of Pennsylvania’s Groundhog Day festival replace Punxsutawney Phil with a robotic stand-in. A disgruntled Phil has steadfastly refused to abdicate his position and be replaced by what he calls a “animatronic fraud”. 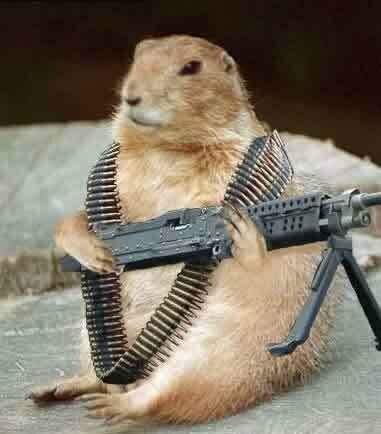 He has reportedly armed and barricaded himself in his burrow, chittering that he would shoot if he sees “anyone’s motherf*cking shadow” . Recently fathering a litter of six and with unemployment at an all time high in Pennsylvania, the laid-off rodent would be hard pressed to find a job, let alone one with a premium Health Plan for his brood. This entry was posted in Comedy, Counterculture, Society and tagged Groundhog Day, PETA, Punxsutawney Phil. Bookmark the permalink.